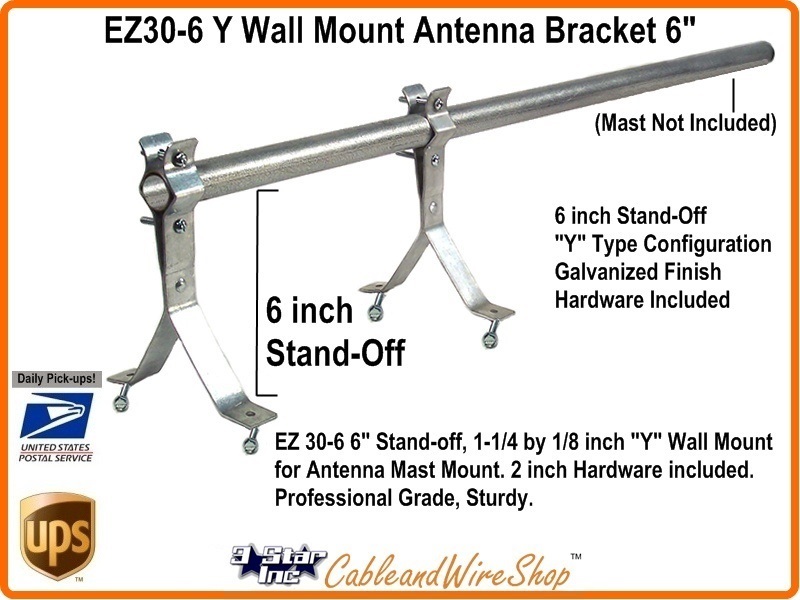 Note: This Series of Wall Mount Brackets for Antenna Masts shares some of the same design considerations as it's big brothers, so you Mount the Antenna and Mast to the wall and have enough Clearance to make it past the Overhang of the roof. Use this one when you need just a little more than the 4 inches of clearance that most "W" brackets afford. If You've ever Installed a Large TV Antenna Outdoors, you know exactly what I mean! It can accomodate from 1 to 1.75 inch diameter Masting for antennas (which is normal) safely with the 2 inch long Hardware that is supplied. If you are Installing 2 inch or greater diameter masts or any mast greater than 10 feet in height, use the "W" Version Brackets instead and run the Mast length all the way to the Ground, resting the weight on a Mast Ground Plate and affix an Earth Ground there with a 5/8 inch diameter, 8 foot long Ground Rod as a minimum.